The walls of her studio are organized with neatly framed photos of her art. Hands and fingers stained with a dark reddish-brown ink. An art form passed on to her by women from Pakistan and one she will pass on to her own daughter one day. On her desk are three bowls containing the green henna powder, lemon juice, and sugar. She will use eucalyptus and lavender oils for fragrance and to enhance the consistency of the paste. Mixing these ingredients will make the ink for her designs. Meet Rehma Khan, henna artist. She’s a self-taught, 24-year-old who studied public health at the University of Maryland in Baltimore. But she began offering bridal henna designs to family and friends at 18 and her little business grew from there with help from her sister Nashrah. She also teaches henna classes and makes household items using paint and her designs. How did you become interested and drawn to henna art? Rehma: As a child my mother and grandmother both used henna around me and my siblings. During the holidays my mother would make henna paste and instead of using a cone, she would use toothpicks to pick up the henna and make designs on our hands. My grandmother would wear henna in her hair and have little circle designs on her hands. So that’s how we’ve always been exposed to it. For me, growing up I was always drawing. I practiced a lot on my sister and would make her sit for hours while I tried out different designs. And having parents from India and Pakistan, makes being a henna artist a very cultural thing for me. In Indian and Pakistani cultures why is the art form so popular? Rehma: In the desert areas of Middle Eastern countries with the really hot climates, people used the henna paste on the palms of their hands and the soles of their feet to help keep them cool. The henna leaves itself are an orange color and it was ground into a powder and other ingredients were added to make the paste. Later it was used to make designs at weddings. It’s to the point that it’s now a cultural norm at these events. For me personally my earliest recollection of henna is of my mom making a small box design on my hands and even my fingernails when I was bout 5 or 6 years old. But it wasn’t until I was about 14 or 15 years old that I became interested in making designs myself. Talk to me about your designs. What inspires you to create them? Rehma: I tend to let my brides decide what they want. Some are more traditional and want very intricate designs that stretch from the elbows to the fingertips. 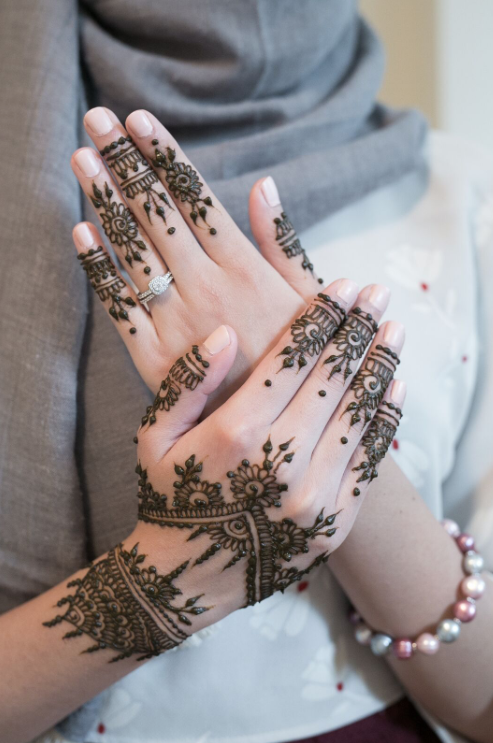 They may request religions symbols that are important and meaningful to them personally and sometimes they may want the name of the groom on their palm. But then I’ve had brides who want more contemporary designs, such as places where they’ve met, a building that symbolizes where they live. So it can vary the designs. But if you came to me not knowing what you wanted, then I would start with a flower design, generally a hibiscus, and then I let my design instincts take over. Henna is kind of like free styling. You can literally create whatever you want and there are so many different designs that whatever you can think of you can create. You mentioned that you teach. Tell me more about that? Rehma: Ten to fifteen years ago when I was in elementary school and I would go to school with henna on my hands, kids would ask me if I got burned. This art was mostly unknown to people outside of our culture. So today it’s really important to me to teach about this art form. I’ve taught workshops on basic technique using both paint and henna. But ideally I’d love to start a program for kids, I think that’s my next step. Rehma: I look at a lot of work by other henna artists and I even reach out and ask them questions about their technique. It helps me stay up-to-date on designs because in this business there are trends that women want. And to be honest, inspiration for me can come from anywhere. I could be looking at a hair bow and be inspired. Truthfully it can come from anything. Rehma’s work can be found www.hennainkrehma.com. Tricia McCarter is a photographer located in the surrounding suburbs of Maryland, just outside Washington, DC. Driven by creativity, Tricia loves to tell stories through her lens. Whether it's a love story, birth story, or life-changing story, she helps capture what is important and meaningful.